The Big Brand Water Filter dual inline TDS monitor allows you to monitor the feed and product water quality on your reverse osmosis system. We have these custom made with 1/4 quick connect fittings on the inlet to monitor feed water and 3/8 quick connect fittings on the post-treatment side to monitor product water. This makes the monitor compatible with all Hydro Line series reverse osmosis systems and all Hydrotech RO drinking water systems. 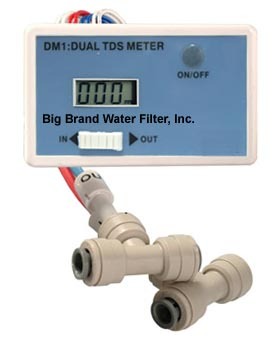 Displays TDS levels of the feed water and product water with in & out electrode probes. Highly efficient and accurate due to its advanced microprocessor technology. Auto-Off function conserves battery power. The unit shuts off automatically after 10 minutes of non-use. Dual Range 0-9990 ppm (From 0 - 999 ppm the resolution is 1 ppm. From 1000 to 9990 ppm, the resolution is 10 ppm, indicated by a blinking x10 image.) Factory Calibrated: our meters are calibrated with a 342 ppm NaCl solution. Meters can be recalibrated with a mini-screwdriver. Comes equipped with John Guest Quick-Connect T-fittings as shown. Installs quickly and easily.